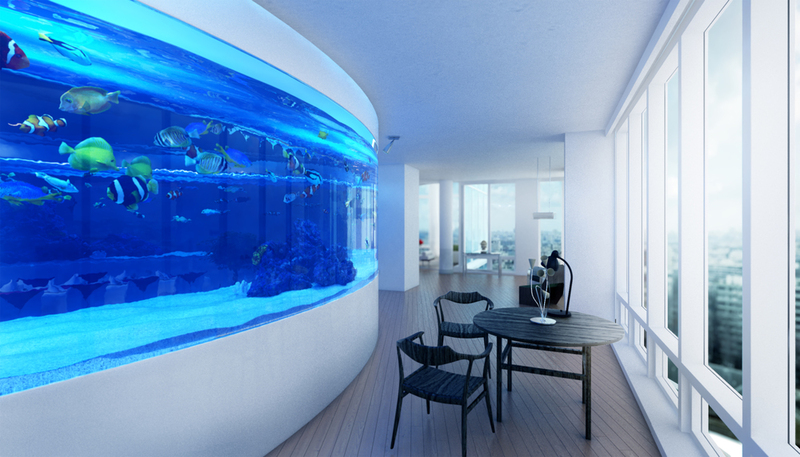 RedFin are often asked buy clients or media companies to come up with unusual aquarium concepts. Our skilled design team are always keen to design some thing that has never previously been attempted before or is very unusual. Below are some of our favourite concepts that we have been asked to develope. RedFin Aquarium Design were approached by the South China Morning Post newspaper who asked us to come up with an idea for 'the ultimate aquarium'. We decided to put a room inside an aquarium so the owner can feel like they are surrounded by the ocean. There is enough floor space inside for dinner parties and dancing. The story below was written for the April edition of the SCMP style magazine which can be found here. Why settle for a goldfish in a jar when you can have the ocean in your home? These days, aquarists are taking their passions to new depths as they explore the many possibilities inherent with a fish tank, such as a dance floor, bathroom sink, coffee table or even a bus-stop billboard. Last year, British luxury gadget designer Stuart Hughes designed the Aquavista Dinosaur Gold, made from a piece of T-rex bone that costs close to US$4.9 million - though some might consider it too small and simple-looking for such a price tag. For those who really want to amaze family and friends, Bruce and his team at Red Fin designed a room within an aquarium. "We wanted the owner to feel like they were surrounded by the ocean, so we created a circular-shaped aquarium with no corners to detract from the feeling of immersion. 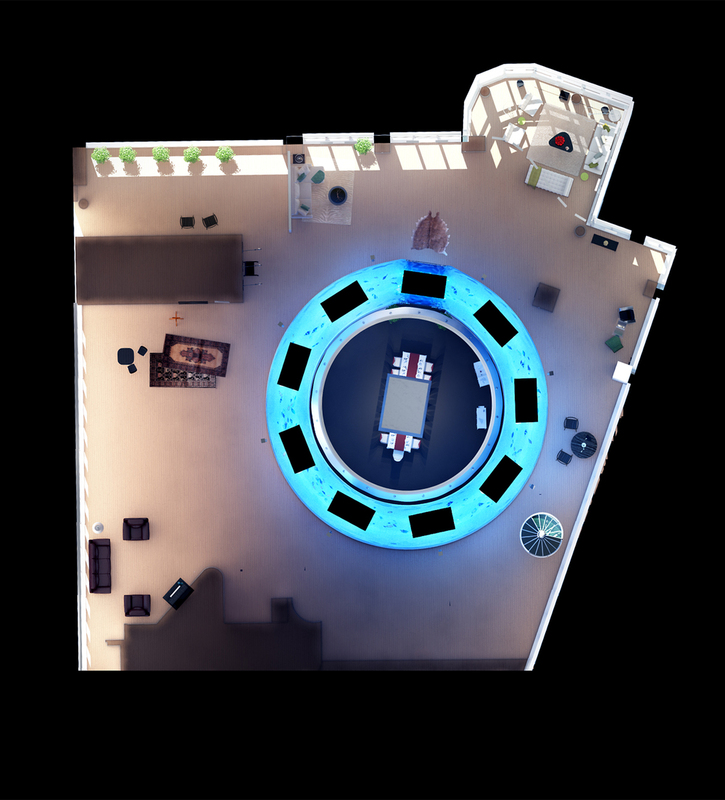 The inner space is 10 metres wide, which means a floor space of more than 75 square metres that can be used for dining and parties, or even live music and dancing," Bruce says. An area with the world's most diverse reefs and marine life known as the Coral Triangle - a geographical zone in the western Pacific Ocean covering the waters of Indonesia, Malaysia, Papua New Guinea, the Philippines, the Solomon Islands and Timor-Leste - is replicated within the aquarium, which holds almost 160,000 litres of water and close to 1,000 fish from more than 100 species. "There are large, eye-catching fish, like the queen angelfish and emperor angelfish, and also huge schools of smaller fish like anthias and chromis, which offer some of the most striking sights on the reef when moving in unison. We also included hundreds of different gobies, blennies and other small fish," Bruce says. The corals that line the aquarium floor are grown from small clippings known as "frags", harvested from reefs. "Most of these would be Scleractinia [stony coral] chosen for their bright colours; we also included some alcyonacea to help mimic a natural environment." A range of shrimp, crabs, clams, anemones, sea cucumbers, small lobsters, urchins and snails are included to enliven the scene and maintain a balanced ecosystem. "Aquarium owners are often very conscious of where the livestock is sourced from, and it is important to them that the fish and invertebrates are aquacultured or collected under sustainable quotas," says Bruce, who has built tanks for everything from giant Pacific octopus to jellyfish. The most expensive part of this aquarium would be the 35-tonne acrylic tank made from multiple 110mm thick sheets that are bent to shape in a factory, then bonded together on site, followed by the installation costs and a state-of-the-art filtration/life-support system monitored and controlled by a computer. "This system can do everything from maintaining temperature and controlling lighting to sending text messages to your phone if there is an issue with the tank," Bruce says. This filtration system uses computer automation to simulate the tank inhabitants' natural environment and would be housed in a separate room either above, below or on the same floor as the aquarium. The lighting would be programmed to follow the exact solar-lunar cycle of the Coral Triangle - illumination would increase in the morning to coincide with the sunrise in Indonesia or Fiji, increase throughout the day, then dim in the evening. At night, LED lights come on to re-create the moonphases as they relate to the Coral Triangle. "Many aquatic creatures rely on the lunar cycle to synchronise mating and spawning behaviour on the reef, so it's important that the day and night and lunar cycles are re-created perfectly in the aquarium," Bruce says. Bruce's job will not stop at the set-up. Once the tank has been built and filled, Red Fin will take care of the maintenance, including feeding, twice-weekly tank cleaning by a professional diver, water-quality analysis and ensuring that all the life-support systems, lighting and filtration are in good working order. 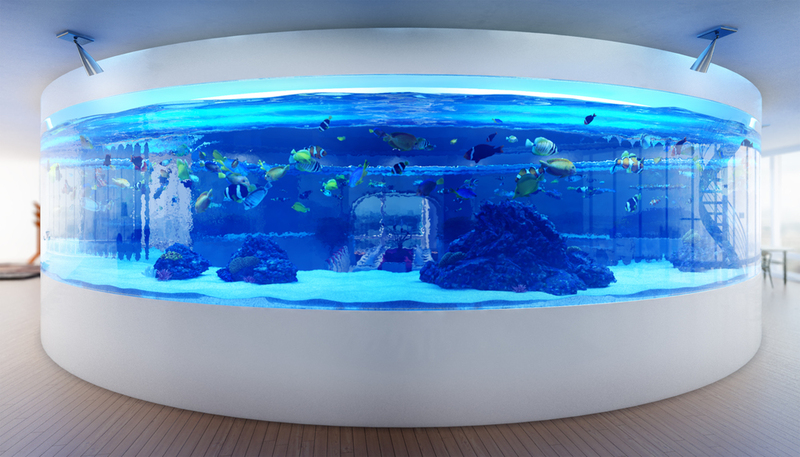 We were asked by a client in a middle eastern country to develop an aquarium with a TV in the centre of it. The TV can pivot in the centre allowing it to be watched form either side of the room. The TV will be surrounded by fish and artificial coral making a amazing and unusual centre piece to a room. The aquarium is designed to be built out of acrylic. A compact filtration system is concealed in the aquarium stand and a custom made LED system is hidden in the canopy above the aquarium. 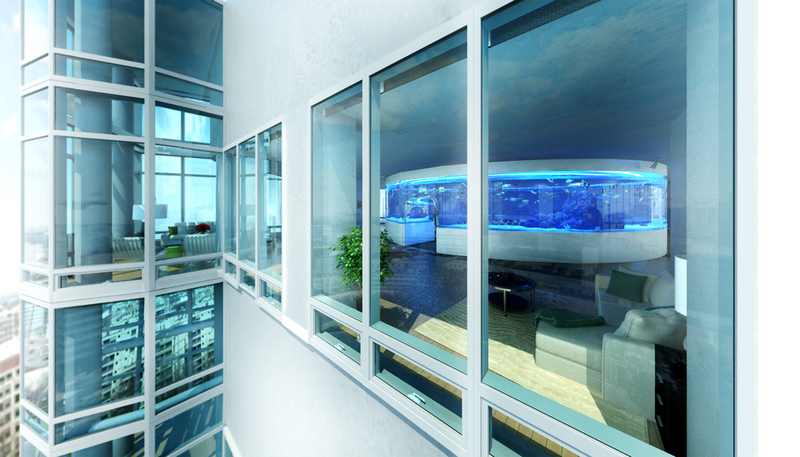 RedFin were also asked to come up with a "glass floor aquarium" concept for a private villa. This latest concept, a large private aquarium with a glass roof, can give the impression of “walking on water” when viewed from above. The aquarium would measure 8m x 8m x 3m. The windows of the aquarium would be made from a high-transparency acrylic, and the transparent roof would be made of glass. The aquarium would also feature a spiral staircase, running around the side of the aquarium and leading to the viewing area above. This above viewing area is what sets this aquarium apart from other large private aquariums. While other large private aquariums have been constructed, they don't give the opportunity to stand right above the aquarium, offering a whole new perspective on the aquatic life below. The acrylic windows will need to be more than 20cm in thickness, as a tank of such size would need very thick acrylic to deal with the large amounts of pressure. As the glass floor would need to be able to support the weight of many viewers at once, it will be supported by specially coated and treated steel beams. The coating and treatment on these beams is to protect them from corroding over time. Rather than using real coral, the tank will contain specially made artificial coral and rock inserts. This will prevent the coral from becoming damaged or bleached over time, which can pose major problems when keeping live corals. This will allow the corals and rocks to preserve their colours for years to come. The corals will be made from special materials in order to do this, and these materials will also prevent the corals and rocks from polluting the water. Due to the size of the tank, many different species of exotic aquatic life can be stored in the tank. From brightly coloured coral reef fish, to small sharks, sting rays and even puffer fish, the combination of many beautiful aquatic species would not only provide a striking centrepiece to any home, but watching the beautiful aquatic life move through the crystal clear water, with a backdrop of bright corals and rocks, would transfix the eyes of anyone who views it. In order to monitor the aquarium effectively and deal with any issues that arise in a timely manner, there will be a computer monitoring system built into the aquarium. This would give the maintenance team remote control of the filtration and water parameters, meaning that any issues to be flagged and resolved in a timely manner. This means that maintenance can be done more efficiently and effectively, protecting the quality of the water and keeping the livestock healthy. The total cost of the aquarium would be HKD$15million. The majority of the cost goes into the high quality Acrylic sides and glass top, which would cost $11.7 million. It will cost $1.56 million to install, and the remaining cost is for the other construction materials, which are; the Filtration room and filtration equipment ($741,000), the artificial coral and other decorations ($585,000) and the lighting and computer control system ($390,000). For a tank of this size and complexity, regular maintenance would be required, which Redfin can provide. A professional aquarist would be required to dive into the tank to clean the glass and the corals, and this would need to be done on multiple times on a weekly basis. The cost of the livestock and maintenance will cost HK$624,000 per annum. “An aquarium like this has never been created before, so this is the ultimate [home] aquarium,” says James Bruce, managing director of RedFin Aquariums.